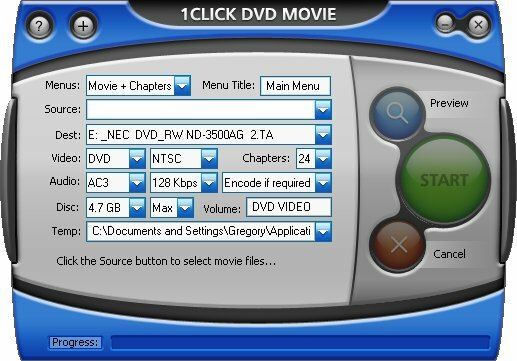 1CLICK DVD MOVIE converts one or more movie files to DVD. This software is compatible with most movie file formats including AVI, DivX, XviD, MPEG1, MPEG2, QuickTime, ASF, WMV and XP Media Center files. With just one click, you can create a DVD movie. You don't have to sit in front of a computer to watch your movie files. 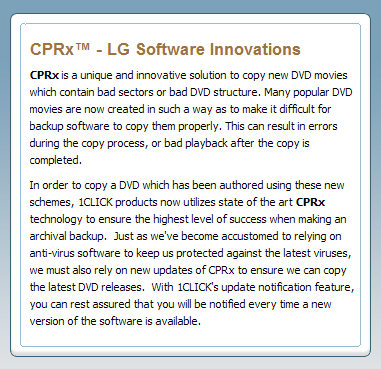 With 1CLICK DVD MOVIE, you can convert your movie files to DVD and watch them on your television. Simply select a source file and click "Start" to create a movie DVD, complete with menus and chapters. Everything is done automatically for you, so it's really just one click. An options window is available for experienced users who want more control. Simple and easy-to-use "one click" operation. Windows Media Player version 10 or greater. 5 GB available hard disc space for DVD image and temporary DVD files. DVD/CD Writer (DVD writer required for burning DVDs). DivX is a registered trademark of DivXNetworks, Inc. QuickTime is a registered trademark of Apple Computer, Inc. Dolby Digital is a registered trademark of Dolby Labs. Creating a DVD is simple - Select a source file and click the "Start" button.